I was hoping to get to this a little earlier, but I’ve been very busy recently. Lexi Neale (whom I have no previous or other contact or knowledge of other than this essay) has written a very intriguing and challenging piece on the Ken Wilber blog offering a pretty radical re-interpretation of AQAL Integral Philosophy. He calls it the AQAL Cube–versus what he sees as Wilber’s AQAL Square. Warning: His essay is heavy-duty intellectually and so will be my response. I won’t bother trying to summarize his entire essay. It’s quite sophisticated and deserves to be read a couple of times, think about it. There’s an enormous amount in there. I’m just going to jump in. Expanding the AQAL domain from Square to Cube may also entail expanding existing definitions, and in the course of this paper I will make every effort to clarify how and why an existing definition could be expanded to embrace the new territory being described. I will also try to preserve existing definitions. For example, the two AQAL Squares of the AQAL Cube will not be given “upper” and “lower” designations, because in AQAL Theory these apply to the quadrants of any AQAL Square. The two AQAL Squares of the AQAL Cube I will henceforth refer to as “below” and “above”; our possessive or material being below, and our non-possessive or non-material being above; or consciousness structures below, and the identity states inhabiting those structures above; or Empirical Consciousness quadrants below and Intuitive Consciousness quadrants above. These differentiations will be further clarified through the course of the paper. You may notice here a potential re-metaphysicalizing of Wilber’s post-metaphysical turn. The distinction between our material being and our non-material knowing is potentially very mistaken. Namely the subtle knowing self is not non-material. It is rather a different form of materiality–or rather is both consciousness-materiality. In fact on this point, Neale seems to be contradicting himself by having a quadrant above–quadrants inherently involve materiality. So on one hand we may see Neale as basically arguing for a renewed perennial philosophy in light of AQAL theory. The names so far most associated with that trend in integral world are Frank Visser and Alan Kazlev. The basic idea is that there are worlds above the gross material. Again calling it non-material is not helpful. Referring to layers of materiality would be better. Wilber’s view on this can be read here where he describes how gross material evolution must evolve so that the higher subtle energies-matter can shine through in this world. This is part of what he calls post-metaphysics or maybe better is called a deeply immanent this-worldly transcendence. On the other hand, Neale may be onto something. But how I think about what he is onto is different than how he sees it. More on that point in a second. But first…one of the difficulties with Neale’s works is that he is focused on the Quadrants. Now this is a fair assessment of Wilber’s work. Wilber tries I think unfortunately to fit all of the pieces of his theory into the quadrants. Levels and lines are show inside the quadrants. And as Neale correctly points out this screws up meditating deeply on the difference between states and structures. Whenever Wilber does a states/stages distinction he reverts to the Wilber-Combs Lattice which as you will note is not a quadrants view. Pretty much admitting you can’t fit that into quadrants. Much less types (which as a result don’t show up in Wilber’s work very much). And so on. If however, we take an idea that is in Ken’s work but has largely been neglected–though picked up by Mark Edwards among others–quadrivia, then it can change. [Sidenote: Mark doesn’t use the term quadrivia but it’s essentially interchangeable with Ken’s understanding]. For example, the AQAL Cube would be able to delegate State Stages and Structure Stages their own quadrants, by which to map more accurately their vastly different perspectives, rather than be lines in the same quadrant of the AQAL Square. The AQAL Cube is not necessary for that distinction. And saying the states have quadrants is probably I think not helpful. My preferred method is to think quadrivia: take a state and then imagine the four quadrants from that state. Ken’s ideas of the quadrants is that they are four dimensions of any occasion. The occasion would be in this case the state and the quadrants the 4 dimensions of that state. Also Mark Edwards and Daniel O’Connor have both pointed out the mis-identification of perspectives with quadrants in Wilber’s work and have shown how you can separate perspectives (modes of being) and quadrants (dimensions of being) out from one another and then relate them. Within what by Neale’s terms would still be called an AQAL Square. I think Lexi has picked up on those points and they are wise ones to pick up on, but one can still have a non-AQAL Square view while still “just” having the quadrants. The Cube in those regards is not necessary. In simpler terms, I think a lot of his criticism of the AQAL Square is a legitimate criticism of how Wilber too often tries to squish everything from AQAL into the quadrants with unhelpful results. A more nuanced take (like O’Connor’s/Edwards’) doesn’t I think have those reductions. So to come back around to the real question: what is going on with this Cube and does it contribute anything? I think it does but I think it does in a way different than the author himself does. The two central issues to be dealt with here, in the raising of the AQAL Square to AQAL Cube, inevitably have to do with reductionism and “flat-land” in the AQAL Square. First, I attempt to differentiate our gross “Being” from our subtle “Knowing”, or What we are from Who we are. The problem here is that our material Being is empirically self-evident, whereas our non-material Knowing is self-intuitive. In my developing the AQAL Cube model I used my own phenomenological experience to differentiate what I am from who I am. I therefore invite anyone to investigate this approach, especially in Second and Third Tier awareness where the differentiation becomes more and more apparent in both Upper Left quadrants (Empirical and Intuitive). I will go further into the Three Tiers later. I also observed that the Self as identity States is of a different order of consciousness from the Self-sense as cognitive Structures and intelligences, for which purpose I introduce the hypothesis that our awareness operates in two Domains of Consciousness – the Gross Domain of the Empirical Consciousness with its Structures, and the Subtle Domain of the Intuitive Consciousness with its identity States. The reference to the Third Tier here is really crucial. Tiers in integral theory are the supposition that in some special cases the move from one level to another is not just an emergent leap of levels (structures) but also a tier-shift. Like an octave shift. Clare Graves called the move from pluralistic-green to yellow-holistic a “momentous leap”. It is a leap not just from one level to another (say in his system blue to orange) but also a tier shift. From green to yellow (or postmodern to beginning integral) is shifting from 1st Tier to 2nd Tier. In Wilber’s color system, moving from Turquoise (advanced integral) to Indigo (and later Violet) is the move from 2nd Tier to 3rd Tier. The Authentic Self, the Third-Tier is somehow the beginning of the Soul/Subtle state become a stage–while still allowing that Soul exists at each any every stage all the way down. That is not confusing Soul as horizontal state-stage at any structure-stage. The Authentic Self is the language of Andrew Cohen. It is used to describe the structural level (around violet) in terms of Self-Identity (i.e. 1st person perspective from within that experience) that in some sense is the Soul as a stage. I argued then–and still do–that Cohen is really the only one consciously seeking to build the Third-Tier. But since Cohen’s model is really built around the experience of being the Authentic Self (i.e. mostly 1st and 2nd person modes of inquiry) it does not entail a larger vision transcending and including the 2nd tier. This is what I think Lexi Neale has done. He’s given the beginning drawing of the Third-Tier in visual form and helped open it out in 3rd person perspective (the over-arching quality to the work comes from this mode of being). That is quite an accomplishment. The only comparable person doing similar work I can think of is Joe Perez and his work on Kronos. Having done so, any new level then goes about re-translating/re-depicting all lower levels according to its own insights. And here is where I part (slightly) ways with Neale. I think he has come into real insight (as he claims and I take him for his word) of the Third-Tier. This is where the Soul–or what he is calling The Intuitive Consciousness–becomes opened up as a stage/structure. He’s then re-read then back into the earlier stages of development where that distinction is not yet available. Wilber says in Integral Spirituality that that earlier features can be said to “sub-sist” (unrecognized) that later “ex-ist” when they arise in worldspaces (p.250 footnote). The factors of what are considered intrisinic subsisting features are themselves interpreted from the higher stages. In other words, it’s all heavily dependent on the stage’s own view (both across if you like any its own level and down). There would likely not be much to reply to in his work from many integral thinkers because the elements he is describing are not arising in that space. I think what Neale has done is re-read the Intuitive Consciousness vs. Empirical Consciousness down through all the earlier stages. Which is fine I suppose but actually doesn’t arise in those worlds. And it doesn’t arise in 2nd tier consciousness. And it need not. Within the 2nd Tier the kinds of nuance Neale is making simply doesn’t arise. There’s no way to agree/disagree. It just doesn’t come up on the radar. Because only in the Third Tier as one identifies with The Authentic Self (Intuitive Consciousness) does one have an identity in which the ego (empirical consciousness) is objectified and therefore seen. With the nuance of an Edwards/O’Connor kept in mind then, 2nd-tier Integral is not reductionistic. It’s just what it is. Like any world-horizon it is limited. And like any emerging horizon beyond that one it’s enduring insights will be taken up into a different world (as Neale has done with what he calls the Square). I’m just not sure defining the distinction between the two as one of vertical (higher vs. lower) is an especially helpful one–particularly in the lower than 3rd Tier levels. Greater depth equals less span. This is a deep work hence it has very little in the way of span. The best it can do is come up with a paradigm-injunction to reveal its own worldspace, thereby satisfying the necessities of a Kosmic Address, and begin its process of unpacking the world it reveals. That’s something to be sure. It’s deep. But I keep making the point that 2nd-tier integral (properly understood) is not reductionistic because the kinds of distinctions Neale is making are not necessary to achieve (2nd-tier) integral work in the world. My experience via Cohen’s work in Enlightened Communication is that the 2nd-tier state/stage distinction begins to breakdown–or rather breakthrough (be transcended)–in the Third Tier. So I’m not entirely convinced that Neale’s way of distinguishing between structures as the empirical and states as the intuitive identity is the right way to go. Or at least if it’s going to work it needs to be clarified relative to the higher evolving structures like indigo-violet in Ken’s color scheme. I think he needs another term than states. Because again prior to Third Tier I think it is much more helpful to think of states as horizontal to vertical structures. This accounts for the Mother Theresa syndrome of extremely deep state mysticism combined with a lower level structural value system (i.e. women belong in a subservient position to men). Otherwise as Lexi says, Ken’s discussion of vertical enlightenment (i.e. highest available structures) and horizontal enlightenment (the state-stage path) and saying integral enlightenment is the combination of the two is redundant. Neale has to do one of two things (or perhaps both). Neale’s understanding of enlightenment means he either has to reject people who show state-stage enlightenment (horizontal enlightenment in Ken’s frame) as not enlightened. Or he has to elevate people to higher structural-stages that they haven’t reached because they clearly show some signs of enlightenment–even if that is coupled with clearly lower levels of structural evolution. Again the Mother Theresa example. In Third-Tier Experience (as stage not just state) the state/stage distinction comes differently, I can appreciate that Neale understands this, but I’m very leery of bringing back in the notion of a Subtle Domain as existing up above material reality. At least as anything more than simply an urge–a de-metaphysicalized Subtle Domain it would need to be for me. the Intuitive (Subtle) Domain is not really an entity in itself but is an emerging overlap, a dilating field of reference between the Empirical (Gross) Domain and the Universal Consciousness (Causal) pervading it, or becoming involved in it. A last point is that in terms of the 24 perspectives (3 persons x 8 perspectives/person), I could use some clarification as to the relation of perspectives (or masks/persona in Neale’s formulation) and other forms of quadratic drawing. Namely it heavily emphasizes identities. In 1st person, perspective #5 (Distal Self, Intuitive Me) is how the Intuitive Self sees itself. Instead of the body and behavior of the Imtuitive Self. Again I would say that is more quadrivia than quadrants–and I’m not sure then the distinction between upper quadrants and lower quadrants is the best way of framing this. As upper quadrivia versus lower quadrivia—primed to the context of self-identities/persona–then that frame is really genius in my mind. Otherwise however I think Naale is flirting with the same “bricking” quality in the Third Tier as Wilber’s has in the 2nd. If they are seen as quadrants (not quadrivia) then there is a real danger here I think of de-materializing, de-socializing trend–a kind of Gnostic heresy. Just to be clear though this only applies if perspectival persona are taken to be the only form of quadrant drawing. This part of Neale’s essay is unclear to me. He might not be doing that. I think it would help to clarify Identity as the Occasion of Experience and then imagine the Four Quadrants (in both Intuitive and Empirical Versions) as if they were four drawings of identity. Except normally the quadrants are: Intentional, Behavioral, Cultural, Social Dimensions of Experience. Not forms of Identity. To shift to Identity is for me quadrivia–imagining. Though again Neale does call 1st person Perspective #6 Behavioral Persona. That might be for me stretching the notion of Persona, but I guess the deeper question (for me) is whether he is equating dimensions of experience with persona. Or persona as the means whereby all dimensions show up. If that’s the idea, then I would disagree. If it’s just one way of sketching it out, then I think it’s very illuminating. We can now take a “Whole Cube” approach to any situation, where we can address the Four Quadrants on each of the six directional faces to take a more comprehensive directional bias: Not only the Intuitive Identities Quadrants and Empirical Structures Quadrants, but also the Individual Quadrants, the Collective Quadrants, the Subjective Quadrants, and the Objective Quadrants, as shown in Figure 11. Again, as Neale says in the beginning this is a beginning sketch and therefore everything can’t be fleshed out, so I want to give him space for that. But it’s interesting that in one way he talks about the Intuitive as higher/above and the Empirical as lower/below and yet puts both of them on the same Cube thereby relativizing (if I understand it rightly) the whole higher/lower thing. As he says the distinction (according to his pov) between the states considered horizontal and the stages considered vertical is meaningless. If so, does that undercut his own higher/lower schema relative to the Intuitive/Empirical Domains? I ask because creating the higher/lower distinction will tend towards a view I think whereby the empirical is basically controlled by the Intuitive. He uses the metaphor of car (empirical) and Driver (Intuitive). I’m not sure that’s the right analogy–except in the experience of awakening to Third tier Consciousness. From moment to moment on any binary-perspective lattice, one of the two octants can be preferentially dominant; meaning that we can also take a reversed perspective, including a reversed Self perspective, when the dominant pole as witnessing “subject” becomes the recessive pole as witnessed “object”. For example, Soul-as-witness (first person Intuitive Upper Left, turquoise altitude) prehending or engaging a recessive pole such as Lower Mind (first person Empirical Upper Left, red altitude), while selflessly chopping wood, can be reversed as Lower Mind prehending Soul in a sudden insight of awesome power. For that same lattice-coordinate the two reversed perspectives produce a totally different experience. That is I think a very profound articulation. Still it could be right but only in the space which it is right. Also I wonder if he needs to be careful I think to talk about the two poles as witnessing/witnessed. What about dialog? Maybe giving and receiving is better? Although not linguistically differentiated from the Second Person Empirical Self, it implies relating to the behavior of another person. Neale describes this as the Three Persons but he’s really doing Perspectives–i.e. modes of taking up positions relative to other beings. “Relating to the behavior of another person” means the 1st person the one doing the relating approaches (via 2nd person perspective, in this case in Neale’s language in empirical domains) to the upper-right behavior of another (2nd person relative to the 1st person doing the acting but from within his/her own perspective, the first person being approached by another, 2nd person to that 1st person). Again I think more perspectives and quadrivia than persons and quadrants. Again though his work is very subtle and discriminating and both are there. The last point I want to make which to me is the central insight of the work involves what drives the formation of Tiers–and why I made all this fuss about 3rd Tier versus 2nd Tier in the first place. In the First Tier, the Intuitive identity States are fused with the Empirical Structures they inhabit, resulting in identifying with Gross Domain materiality, mortality and survival. In Second Tier the Intuitive awareness learns to differentiate from the Empirical Domain as Subtle awareness, resulting in differentiating a spiritual identity. Even though the Integral Level of awareness is indigo in Third Tier, the true integration of the Empirical and Intuitive Domains in Universal Consciousness is not completed until ultra violet in the Enlightenment process. I therefore propose that the three phases as the fusion, then the differentiation, and finally the integration of the two Domains define the three Tiers. This would suggest that one strategy to help nourish the entire Spectrum would be to encourage the discussion of the Intuitive Domain of Consciousness. Second-tier in other words differentiates states and stages and then relates them via the Wilber-Combs Lattice. Third-tier as I said before in some ways moves beyond that (re-integrates). But here again I have a slight disagreement with Neale (again I think). I think he is treating the levels in Wilber’s spectrum as an already essentially built structure. Again there are some (for me) worrying tendencies towards a re-metaphysicalizing. As Wilber says what we know draw as the level violet to ultra-violet may in the future become built as multiple stages. They really aren’t there. Yet. And to the degree they are in an individual they are very deep but very thin. Plus they have no technological-social-behavioral-cultural matrix upon which to manifest those tendencies at this point in Kosmic development. Still, this point about how the Tiers evolve I think is a stunning insight. It also seems to me not necessary to have to accept the idea of 2 planes (Empirical and Intuitive) in order to accept the Tier-driver hypothesis. States and stages can be subsituted for Empirical and Intuitive. In the first-tier they are the same. Or rather since they are fused, they don’t show up at all really. That was Wilber’s brilliant insight in critiquing Perennial Philosophy. In 2nd-tier they are differentiated. In third they shift. My sense of the shift is that is not (metaphorically) best described as above/below, but that’s a point of debate I’m open on. What I think is not helpful for sure though is reading that above/below distinction back down through the levels and then critiquing the earlier levels for being “reductionistic” when in reality, it’s more like, that information simply isn’t available in that world. In a previous post I said I would go to into the metaphors within Wilber’s work combining my long-standing interest in his philosophical work with my new interest in metaphor theory. For the (heavy duty) theoretical background to this piece, see this article by Mark Edwards on uniting the developmental and epistemological elements of Wilber’s Integral Theory. Ken discusses three strands of knowledge—injunction (action), empiricism (experience arising from action), and confirmation/verification (knowledge sharing with the community of the adequate. He relates those to three famous philosophers/schools of philosophy of science. The first (injunction) is Thomas Kuhn and his work on Scientific Revolutions occurring through new paradigms–new practices. The second, the empirical school with roots in Democritus up through Hume and to the Positivist School. And lastly the third, verification being Karl Popper’s (justly) famous work on falsification. To which Edwards adds a crucial missing fourth: interpretation. Science (or here the act of understanding) always takes place within meaning and interpretative contexts. In philosophy of science, this view is associated with Paul Feyeraband. By adding a fourth strand, we now have a correlation between the quadrants (the dimensions of existence in lines of development) and the ways of knowing. See the image above for Edwards’ connection of the two. This learning cycle goes by many different names. The first version of it I’m aware of is the Ignatian Paradigm of the early Jesuit tradition: Action, Experience, Reflection (both philosophical-social and theological), leading to new action. Or Kolb’s learning cycle. Edwards’ article has a whole list of similar variations on the same fourfold theme. Another version of which is the so-called OODA loop of military theorist John Boyd. Observation->Orientation->Decision->Act (which leads to new Observation and the cycle starts all over again). Correlating OODA with the quadrants (as a cycle of knowledge) lends: Action (UR), Observation (UL), Orientation (LL), and Decison (LR). In this sense really an AOOD Loop. The Orientation moment (the LL-interpretative strand) is the one I would like to focus on. Going back to the notion of Wilber’s primary metaphor as map, then we have the map of AQAL as an orientating wisdom. What Wilber in his earlier work called an orientating generalization. One of, if not the, primary experience according to Wilber of postmodernity is that of disorientation. Hence the need for a map. Recall that orientation/disorientation is itself a metaphoric interpretive position (position being another metaphor). I could have said an metaphoric interpretive impulse (over position)–notice the feeling-thought difference between impulse and position. The map as Wilber says is (using a sub-metaphor) psychoactive. It is not simply a theory but rather an injunction-experience-theory-confirmed (all four quadrants/strands again). But my sense has been thinking and living with these ideas for almost a decade now that there has been a tendency to see the map not as orientation but as automatic problem solver. I’ve made this mistake many times myself. A top-down view (which is what the integral view is) is always deeply revealing and simultaneously very seductive. It can seduce one to think that events/life can be managed from the top-down. The view is not the same as the action. The orientation is not the same as the decision nor the action (going back to the language of the 4fold cycle). What is needed is bottom-up action through the mindset of top-down view. In other words, the decision and action phases of the cycle are not predictable via the map. The orientation moment can certainly give clues but they are very generic. The moment of experience needs to be one in which we let go of the map filter for a moment so that we can experience (as much as possible) with the filter intruding too much. In other words, all the elements of the AQAL map–perspectives, quadrants, states, stages, lines, types, self—should only be brought up I think in the moment of orientation. That is the interpretative moment. Otherwise the de facto application of AQAL theory to any subject has generally been something like. The way to do X integrally is to do X across all quadrants, levels, states, lines, etc. I find this approach 1. deflating and not energizing 2. really confusing. Saying do X across all these elements of the map simply begs the question (or at least pushes the real question back one layer still unanswered): how do you do X across all these? Rather instead I would focus–as in holocracy–on simply what is the next best step. What are the best practices in a certain realm–the best practice of X (holocracy being one)—attention to the experience (deep attention). Then in the moment of interpretation bring up (quickly) the elements of the map that are of value, that will orient one to the experience with the content added by whatever the moment/context is about and then having added that integral wisdom then (hopefully) there is a judicious judgment as to what next (the decision phase) and then the application of that decision. That action (the application of the decision) leads to a new experience which will then shed light on the decision. Here then comes the notion of single, double, and triple loop learning. After the new action leads to a new experience it may disconfirm the judgment–i.e. it didn’t work. Then the inquiry (orientation/interpretation growing out of integral mindset): why didn’t it work? Whatever we did that didn’t work might have been right strategically but wrong tactically. That is we might have made basically the right decision as to how to go but the wrong decision as to what to do next that would promote the strategy. This would be a single-loop learning. All we need to do in this case is change to a different tactical action. Now we may interpret/exmaine the experience (which failed) and realize we have the wrong strategy. This learning may come from multiple failures at the tatctical level and realizing we are trying to achieve something from within the wrong frame and therefore no new tactic will ever work as we have the wrong strategy. This would be a double-loop. And then we may even inquire into the process whereby we act-experience-interpret-decide itself. The integral learning cycle offered here is an actual practice that leads to an experience that is interpreted (you have to share with one another what it feels like to proceed this way) that will be verified or not (i.e. “is everybody on board? do you get this? do we find this helpful?”). This is a triple-loop. Learning about the learning. Practicing on the practice itself. Experiencing the experience itself. Interpreting the source of all intepretations themselves. And being confirmed (“strengthened”) in the process itself. In other other words or in conclusion, the AQAL map does not specify content. Not experientially or phenomenologically but also not in terms of decision making. Not really. The process is emergent and therefore unpredictable. What the AQAL map does do is put us in the best place of recognizing (discerning) the potential that might emerge. It puts us in the best place for the emergent grace to happen to us. 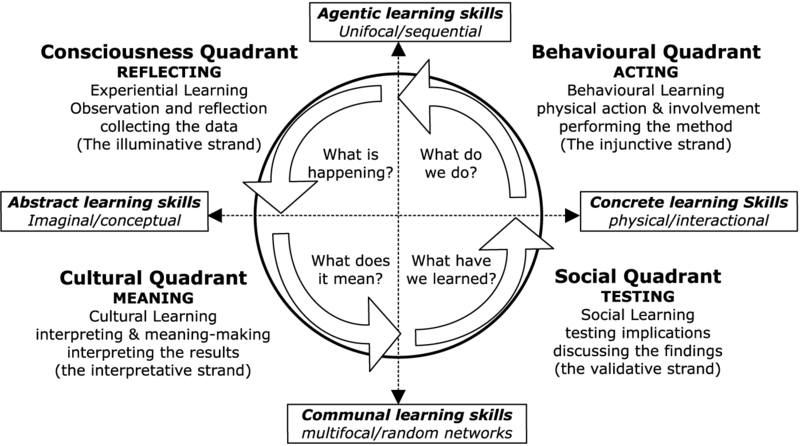 The AQAL map is a practice not a theory alone–it itself follows the four fold learning cycle and should be taught that way as opposed to being a theory. As such it is only one of a series of practices necessary. It is less I think A Theory of Everything but more a Practice for Anything. But it’s a complementary practice—or rather a practice (embedded metaphorically as a map) that orients to other practices. In this way of approaching the work, AQAL then practices its own admonition: it frees itself by limiting itself. Following up on my explorations into metaphor work I thought I would share some of my insights around metaphor within (AQAL) integral philosophy itself. More on metaphor here. The quick version is that language (and therefore communicate) is suffuse with metaphor. Some theorists would say we think in metaphor. Metaphors are not often (even typically) self-identified/self-conscious metaphors. If for example I say I need to stay glued to whatever I’m doing that is metaphor. I could say I need to stay connected to whatever I’m doing at the moment. Connected also is metaphoric but has a different quality than glued. Similar but different. It’s much easier for example to dis-connect than it is to un-glue. Glue suggests a deeper bond (a metaphor from chemistry/building) than connection. In this way of thinking metaphors create their own worlds. They do not point outside of themselves to something else–like an allegory where everything stands for something else and once you figure out the other thing the allegorical term drops away. The metaphor never drops away. It only deepens (another metaphor) or unfurls (yet another one) revealing yet more inner space (third metaphor about metaphors). The key is to keep walking in (metaphor) the metaphor space, keep going deeper and deeper within it. It begins in a sense to answer its own question. You should have picked up by now that question & answer in that last sentence is another metaphor world. I could have said it solves its own dilemma (dilemma is very different experientially than question). In therapeudic contexts the idea is the metaphor space is somewhat separate (object of the subject) and therefore becomes a safe place to explore traumas and pain. The difficulties around a trauma are faced in the metaphor space not in the core of one’s subject (in which case the person might simply be re-traumatized). In philosophic contexts–the context for my purposes here–I use metaphor work to get under (metaphor) and into the world opened up by the philosophy itself. This then similar to the therapeudic work creates a metaphor space in which (metaphorically) one can walk and feel around. Accessing this space allows for greater comprehension I’ve found of the material–it accesses a different intelligence or so. What before is often considered difficult, heady, and abstract (the philosophy itself) is now an invitation into a contemplation of being. I have begun both of my Integral Christianity classes exploring 2 metaphors that Ken Wilber uses to describe his own work and a third that Mark Edwards added that I think is a valuable addition (not used by Ken himself). The two metaphors self-consciously deployed by Ken Wilber himself to describe his own work are map and story. Wilber identifies himself as a mapmaker and storyteller. The additional metaphor is lens. I’ll take a separate post on each one starting with map. Apologies again for it being about a month since my last post. A number of folks wrote in to ask whether I was keeping the site alive or not. The answer is I intend to and now that I am done with school believe I will have more time to. I do have to confess to some trepidation around returning to blogging here. Any of my more public (or less personal) blogging now goes on over at The League of Ordinary Gentlemen. That experience continues to be a very rewarding one for me. More rewarding as part of a group than it ever was here in a solo effort (on politics, social commentary, etc.). To set the stage, a long quotation from Evelyn Underhill’s text Practical Mysticism (a sort of digest version of her classic Mysticism). You are therefore to let yourself go; to cease all conscious, anxious striving and pushing. Finding yourself in this place of darkness and quietude, this “Night of the Spirit,” as St. John of the Cross has called it, you are to dwell there meekly; asking nothing, seeking nothing, but with your doors flung wide open towards God. And as you do thus, there will come to you an ever clearer certitude that this darkness enveils the goal for which you have been seeking from the first; the final Reality with which you are destined to unite, the perfect satisfaction of your most ardent and most sacred desires. It is there, but you cannot by your efforts reach it. This realisation of your own complete impotence, of the resistance which the Transcendent—long sought and faithfully served—now seems to offer to your busy outgoing will and love, your ardour, your deliberate self-donation, is at once the most painful and most essential phase in the training of the human soul. It brings you into that state of passive suffering which is to complete the decentralisation of your character, test the purity of your love, and perfect your education in humility. In the classic depiction of the Christian spiritual journey, this is the third and final phase: union (of spirits). The first two stages being purification and illumination. It is the difference St. Teresa of Avila says between watering your own garden via an aqueduct and a deluge from the heavens soaking the garden. It is the transition in St. Teresa’s mystical cartography from the Sixth to the Seventh Mansion. Now this blog (and my practice which united at various points, interpenetrating and informing each other) over the years was mainly about the missing fourth stage (that is no stage) the so-called Nondual or better in its native Christian language Indistinct Union. That phase of inquiry opened up a few years back into a deep inundation in that state. I don’t really like to talk in this manner because the subject-object formation of our grammar forms us into a notion of a separate self attaining ownership or mastery of some state. Like an acquisition. Some achievement. When the reality of Indistinct Union is utter lack of achievement, the end of attaining anything. It’s in some ways a kosmic joke. It took me years to not see it as a bad, cruel joke frankly, but that only speaks to how much egoism I held (and still do) in wanting to be capital E Enlightened. So while some would see the path as normally going purification, illumination, union, and indistinct union, the last mode is actually always already the case and therefore can be sunk into (or happen upon you) at any phase of the journey. But (and here I hate saying it this way but here goes) my journey (ugh) did not follow this pattern. If I would categorize it–and to do is folly but hey I’m this far in what the hell–it was purification, illumination, and then indistinct union. The union largely skipped (or short-circuited depending on your pov). What has occurred in the time since I last wrote is that the spiritual process, after a kind of hiatus (largely repressed through seminary [mal]formation), is picking back up at the missing piece. Or I should say (and here an ‘I’ matters) that is what I feel I am being called towards. Whether I choose to accept the invitation and undergo it is a different question. The bundle of fear from my last post that remained unnamed and un-understood, un-cognized was opened to me during Holy Week. It was the fear of undergoing the process towards union. The ego in Indistinct Union is not actually purified/transformed. It is no relative but rather Absolute. Realize or realize not, there is no try (there). One simply experiences beyond a self. But that realization is only capable through a self: a body-soul-mind construct. The self in this case is often referred to as a vehicle. Therefore the vehicle (and I lack a better metaphor though I’m not entirely happy with this one) should be in proper shape (“at-tuned”). The ego in union is crucified. In indistinct union it simply disappears (“ascends” in Christian symbolism). It is the crucifixion that brings so much fear within me. As Underhill’s quotation makes clear, the process of undergoing union is to enter into total darkness. A darkness that is luminous in Dionysius’ language. A darkness that is the ardor of sacntified love (in John of the Cross), a unknowing of a Cloud within which God and the soul unite (under an unknowing cloud). Learned Ignorance Nicholas of Cusa called it. (Docta Ignorantia–click here for a pdf of the work). I am must become doctored in ignorance. But learned ignorance. Not that I will forget how to do my job, where I live, make sense of the world around me. But rather to dis-identify/objectify all of that and fundamentaly not know–the essence of anything. All of the metaphors regarding union are that–metaphors. Rains from heaven, luminosity in darkness, a Cloud of Divine Unkonwing, Mystical Marriage, The Coincidence of Opposites (also from Cusa), a night of burning ecstasy. The metaphors are cataphatic atempts to express (and give praise to/for) the apophatic. The way into that process is learned ignornace and its twin, abandonment to the will of God in the Sacrament of the Present Momen (another metaphor for union)t. I actually know the way (or maybe the way knows me). But it is so taxing and difficult to maintain. And yet actually it isn’t. It actually is too simple and too close which is why it is so hard. One practices learned ignorance (“detachment from/non-identification with”) all one’s own knowledge, emotions, and reactions during the time of normal working/waking life. Detaching via learned ignornace frees the self to attach to and seek the will of God. Rather than identifying with the mechanically caused world of events and perceptions–this slow world–the aspirant seeks to unite to the Cause of All (called for this reason Causal in Vedanta terminology). The same is true for times of meditation or prayer. it tends to deepen there but it can just as easily be times of total boredom, nothingness for long (seemingly unending periods). But ultimately what this is all about is the purging of everything that is not God from the self. The illumination-stage mystic has many experiences, many subtle understandings but is not yet totally converted. Is not yet totally surrendered. To surrender is to lose power and control. This is what my self fears the most and why I have run terrified from this space for so long. The union-stage mystic must learn about Providence in de Caussade’s language. About The Cause/Sustainer of this all. A fearful asymmetry there lies ahead. [For background on this post, see here]. A review of a process I undertook on myself this morning after a series of days having very frenetic/chaotic dreams and waking up with a good deal of confusion-stress. I feel myself right now split into almost two zones. Zone 1, as it were, is my day to day generally content layer of experience. While I’m very busy in an incredible number of ways my life is really good. I’m deeply at home with my wife and our relationship is very life-giving, life-affirming. I’m almost finished with school, which I’m definitely looking forward to, and while not the best of all solutions, I have a job to carry me through in the interim period between graduation and whenever it is that a parish appointment becomes ready, then I’l be ordained and enter ministerial life. I live in a nice, safe neighborhood in a beautiful city. So things are good on those levels. I’m very grateful, feel very blessed in my life. As I lay in bed this morning I could feel that space. I came to decide (or more like “it” decided) that these set of more positive, sorta easy relaxed feelings were located up above my head and slightly behind me to the left. Just over the pillow, floating slightly above the bed. When I put my attention to that space, those feelings were more pronounced. Another set of feelings, which felt as if they were riding in a plane beneath the former set, were also apparent as I groggily lay in the bed. It was a feeling of a bundle of agitation and nervousness. This feeling was located in my stomach. The process of locating them in a very literal sense created a clear bifurcation and spatial separation. I oculd label where I was betwixt the two A. The easier/more relaxed feeling-space B; the more difficult and confusing one C. [This is not exactly how it is normally done in Clean Space Technology, but for now that’s ok]. When I inquired as to what Space B knew, it was the kinds of things I mentioned earlier: gratitude, blessings in life, natural ease in the life process. Interestingly when I looked into Space C (i.e. the agitation), it knew that it did not know. I was expecting this space would know what the cause of the agitation/stress was (especially since it’s somewhat weird given everything else in life, including Space-Feeling B). The word “bundle” is the metaphor; the metaphor is the key (more on this idea here). The key is to enter the metaphor (and not seek what the metaphor externally refers to–the metaphor is itself the central thing). [For the theoretical background, this is now mixing symbolic modelling with clean space, both outgrowths of the work of David Grove]. The metaphor-image of bundle led to a futher clarification–an image of a rope tied around the bundle. –What kind of rope is this rope? Heavy. The kind that would rip/cut your hands if it slid across them quickly. Almost like straw–which brings me back to the bundle image. A bundle of bundles. Themselves tightly wrapped. Here it breaks off and I feel the need to step away and come back to this issue at a later time. To anyone out there still reading this, I’ll be returning shortly (and at first probably a bit slowly then picking back up the pace) to blogging here at Indistinct Union. The time I have spent with the start-up at The League of Ordinary Gentlemen took more time/energy than I had initially anticipated. But it’s all good because that has turned out to be a very successful (so far, knock on e-wood) and very fulfilling experience for me. So my political, economic, military, foreign policy blogging is all over there. At the beginning of this year I began to experiment with a new form of writing-meditation based on the philosophical writings of Ken Wilber wrt his work on perspectives and what is termed integral post-metaphysics. For my initial post introducing that theme here. That bore some interesting fruit in a series of blog posts examining other writer’s pieces from this lens. (e.g. here). They are filled under the Integral Calculus Categories on the bar to the right for those foolish enough to desire to read all of them. I found that a freeing, enlightening, moving, feelingful kind of experience. But I could tell since I was starting first with the views of others, it was still distanced from me. I was looking for a way to initiate the process more from within my own experience. It was then a few weeks later that a friend turned me onto the work of (sadly now deceased) David Grove called Clean Space. For my entry on that here. I’ve been way too busy in since then (about 2 months ago), to really roll with this, but am now feeling the drive to come back to this set of practices, ideas, explorations which revolve strongly around the idea of each of us having our own unique understandings/creations of landscape through the use of metaphor. Clean Space practice-feeling-thinking (it’s hard to call it any one thing) relies on the idea of imaginatively (and literally-concretely) locating/placing certain aspects of experience in certain spaces. And then speaking as if from each space. This all connects very deeply with Wilber’s notion of the perspectives and links up perfectly with Wilber’s core metaphor (metaphor-scape) for his own work which is as a map. 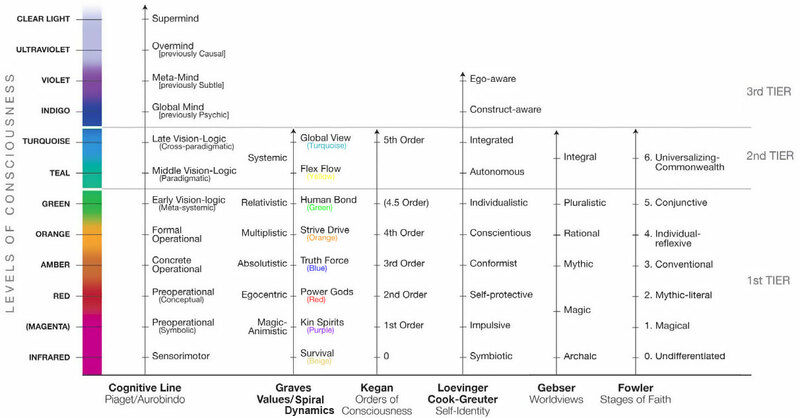 A map of consciousnesss–i.e. interior location. I’m sensing that this blog will become the platform for me simply to share in some sense the experience of walking through this world of ideas, metaphor, practice, inner feeling and the like. [I’ve added a Clean Space category on the right to keep this series]. One of the central insights of Grove’s work was that the metaphor space creates a bit of healthy distance. He originally worked with people who suffered brutal traumas and found that traditional psychotherapy might bring people back into the pain thereby re-traumatizing them. The metaphor world (of their own creation) was somehow a place of more safety and clarity. So to apply Wilber’s insights to the Clean Language/Clean Space/Metaphor Realm–the writings here are an interpretation of my experience (itself already an interpretation) being with the metaphor space. As Wilber says, it’s all an unending cascade of perspectives-choices-experiences. Also I should say that my way of doing all this will incorporate some other elements and is therefore probably not a precise version of all this. e.g. Some dipping on occasion into Eugene Gendlin’s work on Focusing. My buddy Ian Johnson who turned me onto all the Grovian work–his application of the work here–led me once through a process growing out of these ideas. I’ll be working off that initial exploration with likely more to come in the future.